We love to add beauty to spaces and are lucky to work withthe most beautiful medium in the art world, flowers! 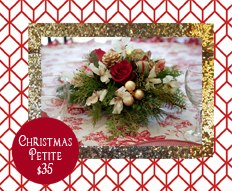 We make fresh handmade Christmas wreaths, swags and centerpieces. Available in many sizes, themes, and color schemes they are the perfect home decoration for the season. Nothing smells more like the season than decking your halls with pine, cedar, or fir boughs! We'll be at the show on the 1st weekend. In the meantime, check out our website!